Bernard Cecil Gotch was born near Winchester and attended Winchester School of Art, first as a student and then later as teacher. By 1910, he had received his first notable commission illustrating A Shepherd’s Life by W.H. Hudson. In 1952, the University of Oxford made Gotch an Honorary M.A. After he died in 1963 a memorial service took place in Oriel College. 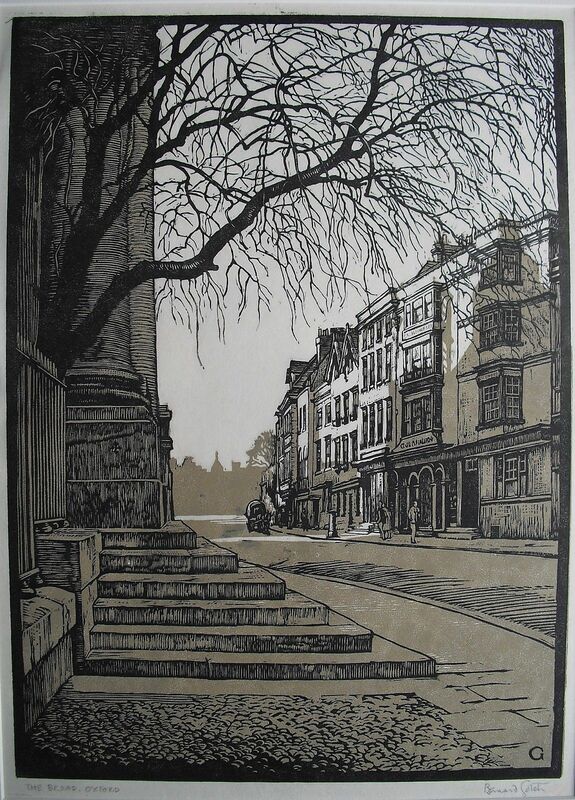 This woodcut shows “The Broad” or Broad Street in Oxford, a view from the steps of the Clarendon Building, which was built in 1711 from designs of Nicholas Hawksmoor for Oxford University Press. Some have speculated about the heavy architectural bias suggested in the Community Collection, an “unseen hand” that has helped to shape it. Nonsense. By agincourtiowa in Landscapes & Livestock, Uncategorized on Thursday/07/May/2015 .